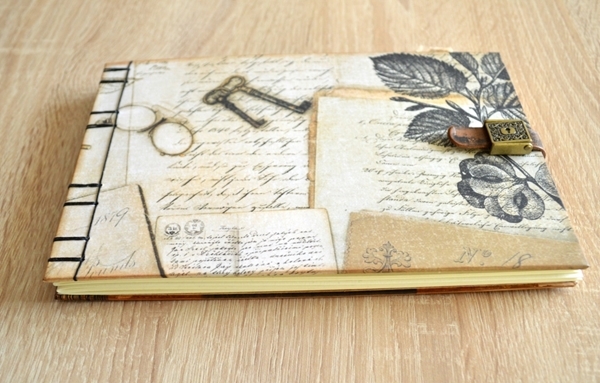 It is a side-bound journal - album ,hardbound with the coptic binding. Its size is 21.5 x 14 cm ( appr 8.5 x 5.5 inches). It features 60 pages (counting both sides) of 170 gsm watercolor journaling paper of supreme quality, suitable for all wet and dry media. Its closure is inspired by the diaries used during the previous century. At the back cover, I have attached a folder, ready to keep your notes or memorabilia. I have also included a vintage card and a beautiful tag. This is a journal ready to be filled with your thoughts or memories, your art or for any other significant occasion that is worth a touch of luxury..